HTRI Xchanger Suite - комплекс для расчета теплообменного оборудования (проводит проектный, поверочный расчеты, симуляцию). Комплекс предназначен для расчета следующих видов аппаратов: кожухотрубчатые, пластинчатые, "труба в трубе", спиральные, с оребренными трубами, а также огневых подогревателей и печей. TRI Xchanger Suite, from the global leader in process heat transfer and heat exchanger technology, includes components for heat transfer and associated calculations of heat exchangers and fired heaters. HTRI’s calculation methods are backed by more than 55 years of extensive research and data collected on industrially relevant heat transfer equipment. Based on the results of this ongoing effort, we update our methods to meet your evolving engineering needs. 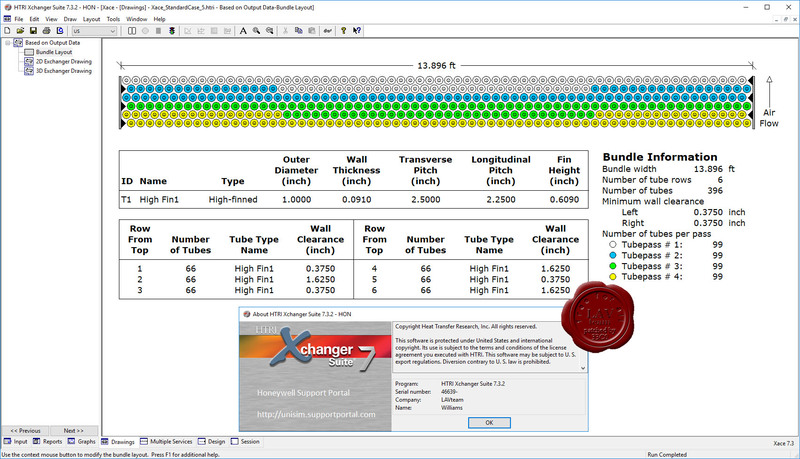 All Xchanger Suite components are highly flexible, allowing rigorous specification of the exchanger geometry. This capability makes the best use of HTRI’s proprietary heat transfer and pressure drop correlations and allows the most accurate performance predictions possible for all exchangers.